WARNING!! NOT FOR THE POLITICALLY CORRECT! 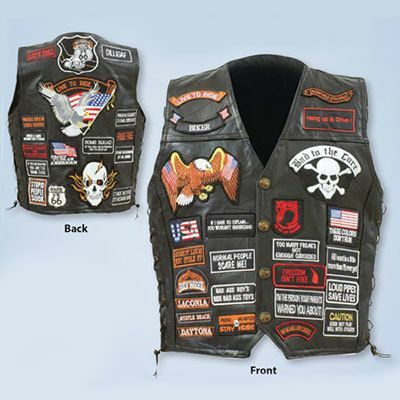 This genuine buffalo leather vest is fully lined in comfortable polyester and is ideal for bikers and hog riders at heart. Original Diamond Plate™ design features 42 biker and USA patches individually sewn on the front and back. Sides vented with lace-up grommets for comfort, 2 zippered pockets inside and snap front closure. Design may vary slightly. Imported. Dry clean only. 24"l. Hurry! Quantities are limited!